"Hey Pierce. 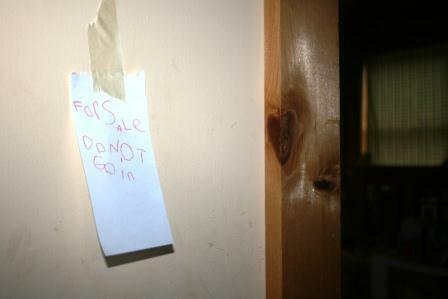 How come there's a sign that says For Sale by your room?" "Really? Where are you going to live if it sells?" "It's only for sale for a little while." "Okay, well you might want to clean it up before you put it on the market." Disclosure: Should you be interested in my 5 year old's room, you should know that it currently, still, has no power. Maybe we'll get lucky today? so funny! I take it one of your sons wants to sell? He is quite an entrepreneur! Thank you this made me laugh out loud Lisa we all need laughter in these times. You have a upcoming comedian in the family. That is too funny. I hope you get power back soon! HAHAHa!! Love it. And, also hope you get power TODAY! Ever hear the song "Brother for Sale, .50?" I guess it could be worse. So funny! Bless your heart for still surviving with no electricty. You are one tough Mama! Still no power! You poor things!! Hopefully SOON! he's creative. gotta give him that! What an imaginative entreprenuer he is turning out to be! Maybe today the power will be up . . . I'll hope for you! rough this time of year.I would be melting here, it is suppse to be 103 today. Oh no! Hope y'all get power back today. Sheesh. Your five year old is too cute. Out of all my kids no one ever tried that one. :) What a creative mind. I wonder where he got the idea to sell his room! Fascinating. Hope you have power now! I must have missed something about no power - in only one room? Love the sign. When I was little, the first word I learned to spell was allowed. Boys can be so dear. I hope your power returns soon. It has been a while. Haha! Has he had any offers? I sure hope you get power soon! That must be miserable in the heat. ok, I thought that was some line from the tv show M.A.S.H. when I read Pierce. hahaha. nice name. Wow, still??? I hope you get it back soon! Hope your power comes back soon- I remember the freeze of 2001- we were without for ten days...it was awful. Too cute! It reminds of the time my daughter wanted to rent out one of her dolls...but only for 5 minutes! That is hilarious! I love the 'do not go in' part! What a cute mind he has! having taught preschoolers for 36 years, this post mademe laugh out loud. I;m back from vacation and blog hopping. Please stop by my blog for a visit. haha...i would sell it too. no power, tell him he may have to discount it!! sometimes they are too cute for words!! oh yay! I love when I find others that eat similarly or the same as my tastes... yay! Let's do lunch at the next convention. ROFLOL! That is too funny! I remember doing things like that when I was little! LOL! Too funny! Where do kids come up with this stuff anyway. Loved your come back. That cracks me up! My older daughter is going through a big 'selling things' phase too. Yesterday afternoon she was trying to sell cups of mud for $10.25 each. I tried to convince her to sell lemonade instead, but she was pretty sure what people REALLY want is sludge. I hope your power comes back on soon! I'm hoping that two days after that you DO have power. Goodness! Lol. Bummer about not having power though. I hope it'll be restored soon. so funny! Minus the no power part of course. That's so funny. I love how little minds work. When I was little I was going to run away. I packed up a ton of my things, walked down the hill and came right back. I love these first displays of literacy!